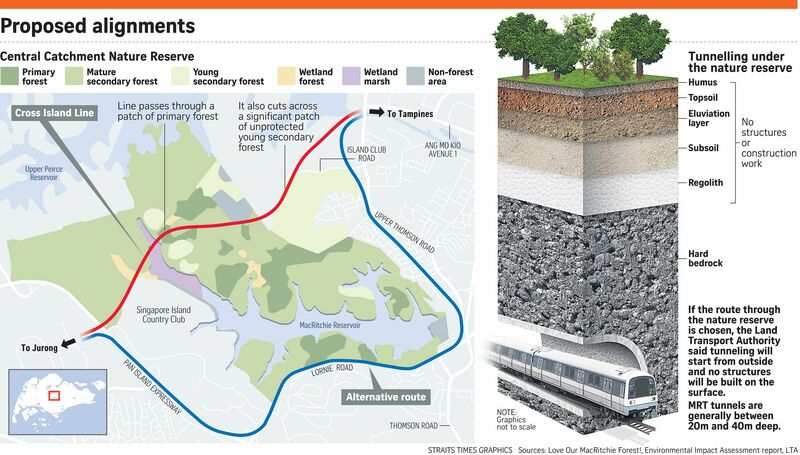 Even as green groups lobby for the Cross Island Line (CRL) to be built around Singapore's largest nature reserve instead of cutting through it, residents are worried about the impact this will have on their homes and lives. The proposed 9km option, which skirts the Central Catchment Nature Reserve, will run beneath a swathe of private homes near Upper Thomson Road, such as Windsor Park and Yew Lian Park. It then turns west under Lornie Road before heading northwards, parallel to the Pan-Island Expressway. The Land Transport Authority (LTA) has said that it is studying both alignments for the CRL, a 50km line connecting Changi to Jurong and expected to open in 2030. It has yet to make a decision. If the option to go around the nature reserve is accepted, "underground MRT tunnels will go through homes, businesses and buildings, and acquisition may be needed", the authority said. The media publicity surrounding the CRL project, following the release of an Environment Impact Assessment (EIA) two weeks ago, has left residents jittery. A third alignment option for the Cross Island Line, this time going beneath MacRitchie Reservoir, was considered by the authorities. This was revealed in the Environmental Impact Assessment (EIA) report released about two weeks ago. While the route would avoid cutting through the Central Catchment Nature Reserve (CCNR), it had to be ruled out "primarily due to technical risks associated with its location along a geological fault line", the report said. The EIA report also noted how adjustments were made to the other two proposed alignments. The one which cuts through the reserve was tweaked to follow under existing trails and "disturbed areas" within the CCNR, thereby avoiding the need to clear vegetation to create work sites. For the alternative alignment, which would skirt around the nature reserve, adjustments were made to follow existing roads as much as possible. The EIA report was put online on the LTA website on Friday so that the public can access it more easily. It provides an assessment of the environmental impact of site investigation works that will be performed for the two alignments. At the end of the day, not everyone will be convinced, because we have conflicting objectives and needs in the country. But all views should be taken into consideration. The process is as important as the decision. The EIA said there would be moderate impact on plants and animals in the nature reserve if mitigation measures were used. For the other alignment skirting the reserve, the impact would mainly be noise disturbance to people, it found. Yew Lian Park Residents' Association, which covers 216 landed homes, is firmly opposed to having the MRT line built through the estate. Its president, 69-year-old Sangameswaran, who goes by one name, has been living in the area since 1964. "The MRT line's construction will affect us, and not just in terms of noise," he said. "There is a strong possibility of some of us losing our homes. We'd rather the line go through the reserve," said the manager in a scaffolding company. Mr Ong Tee Chew, 72, who has lived in a terrace house in Soo Chow Walk for more than 40 years, said he and his neighbours are a tight- knit bunch, like a "big kampung". "No matter how much money they offer, I still wouldn't want to move," added Mr Ong, who works in construction. Member of Parliament Chong Kee Hiong, who oversees the Bishan East-Thomson constituency, said the estates which the CRL could tunnel through are between 50 and 60 years old, with residents who have lived there for as long as 40 years. Besides the emotional attachment some may have to their homes, residents are also worried about the added disruptions that the construction work may bring to the area, with one project coming after another. Mr Chong said construction of the Thomson-East Coast Line tunnels and the nearby Upper Thomson station is ongoing and will finish only in 2020. Construction of the North-South Expressway, expected to start this year, will also affect the Marymount area. "It's one thing after another for the residents," he said. The upside of having the CRL run through the Thomson area, Mr Chong said, may be a new MRT station that will boost connectivity. But some residents feel this would not make much difference. Mr Tyler Foo, 25, who just finished his undergraduate studies, said Marymount station, on the Circle Line, is a 10-minute walk from his home. The future Upper Thomson MRT station will be five minutes away. "Any added benefit from a new station will be insignificant." Some residents, however, do not mind moving. Retiree Sim Song Koi, 77, who has lived for more than 40 years in a terrace house in Soo Chow View, said: "At my age, I don't really mind where I live, as my children have already moved out. "As I will be compensated, I can just move to a new house - I don't need such a big one any more." What most residents agree on is the need for more clarity on the degree of land acquisition and disturbance. The second phase of EIA to gauge the potential environmental impacts from the construction and operation of the line on both alignments will be finished this year. Mr Christopher De Souza, chairman of the Windsor Park Residents' Association, said: "The authorities have not been specific about how much more time the alignment around the reserve will add to travel time, how much more it will cost to build, and how many houses and their location in our area may be acquired." The association covers 225 terrace houses, semi-detached units and bungalows. The 62-year-old retiree added: "We're in the dark. With no details, everyone is imagining the worst-case scenario where theirs is the house that is taken away." The LTA said it has been engaging the advisers and grassroots leaders in the area. A meeting took place on Monday, with more to be held. Engineers believe that some land will have to be acquired, should planners choose to skirt the reserve. Mr Chong Kee Sen, president of The Institution of Engineers, Singapore, said above-ground ventilation shafts must be built along with the tunnels to remove stale air and allow fresh air to flow underground. On the shorter 1.8km tunnel that cuts through the nature reserve, these may not be needed, but the longer alignment will require them. Vertical tunnels, from which the tunnel boring machines can be deployed, will also require land to be cleared. If the authorities decide on a new underground station, that will also need land. MP Chong said: "At the end of the day, not everyone will be convinced, because we have conflicting objectives and needs in the country. But all views should be taken into consideration. The process is as important as the decision. "